Most of you by now will have seen ‘The Best Twitter Conversation you will see today’. Lauded as an example of how brand social media managers can join in the conversation and have some fun. 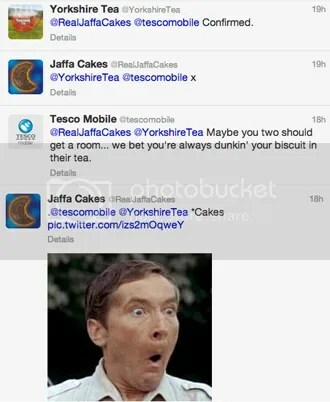 Not forgetting that the whole scenario kicked off with Tesco Mobile dealing with a sarcastic customer tweet. This is yet another example of the benefits of live (and listening) social management. Where there is always a hand on the keyboard waiting for the opportunity to have a conversation (no matter which direction it may go). Much of Social Marketing has it spot on. While over in Recruitment, there currently is a seeming obsession with making life easier with technology and the ‘effective’ use of social media through time saving platforms. Common or garden ‘Scheduling’. Now think on. Would that Tesco Mobile, Jaffa Cakes et al, scenario have ever played out for recruiters and recruitment accounts doing that? Mostly not. We think that’s a shame and the reason why 99.9% of our social management has always been live. Behind every tweet and update, there’s a real person at the keyboard. It’s amazing the number of conversations we’ve engaged candidates in by being there in real time. And not it’s always about serious recruitment questions. There’s fun to be had in recruiting too. Especially when you’re there at the moment, that’s what really matters. And it should be no surprise what a real difference it achieves to how you’re perceived as an employer. Plus it’s much more enjoyable than letting your ATS autotweet every vacancy that goes live or constantly setting up Buffer a week in advance. There’s going to be a mashup next week. 2 award events. 2 consecutive nights. 7 shortlisted nominations in total. In celebration, it’s time for another of our andsome blog ‘mini series’ inspired by this magnificent seven at the Digiawards and the CIPD Recruitment Marketing Awards. In the frame are websites, social recruiting campaigns and employer branding for Boots, EAT, SC Johnson, TK Maxx and the Raymond Blanc Cookery School. Now mashups normally create something unique – so, this series is all about uniqueness. From the use of social platforms, the big idea (remember that one), the audiences and the candidate experience. They’ll all be in the mix. It all kicks off on Monday. We hope to see you then. 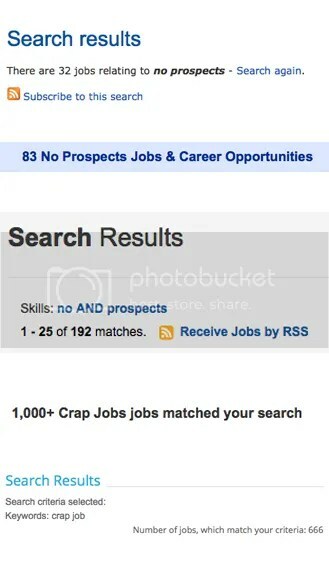 How many crap jobs does your careers site contain? Searching on jobsites for jobs with no prospects? Amazingly they do exist. Obviously taking transparency and honesty in recruitment to the max. Try finding similar opportunities on yours. 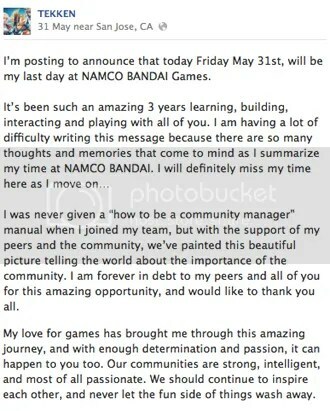 Above is the ‘resignation post’ by Rich ‘FilthieRich’ Bantegui the Facebook Community Manager for Tekken (that’s a fighting videogame). A perfect representation of what it takes to be manage a community on Social Media. It’s all about passion. Whether you work internally or externally for a brand, it’s your interest and involvement in that brand that needs to come through. It doesn’t matter if you’re social marketing or social recruiting, that factor is the same. It’s about hearts and minds, not excel sheets of content and timeplans of updates. And for social recruiting especially, it’s chasing the holy grail of conversation with, and amongst, candidates. That’s true engagement. The real buzz of being involved with a recruitment platform. The more mechanical engagement of ReTweets, Likes et al just don’t compare with that human element. The candidate engagement should drive your approach and creativity. Which in turn drives their involvement with you. You can’t really have one without the other. In our opinion, community management is never just a job (even if you’re ‘selling’ jobs). On the Job experience. That’s often the starting point for many a successful career. It’s an ethos that has come back into vogue over recent years with Work Inspiration (for 14-17 year olds), Internships/Placements for Students and Apprenticeships instead of Uni. It’s all about the learning. In the working environment. Especially the apprenticeships route, learn while you earn is the phrase. Where you’re working for real, not just attending lectures with the odd practical thrown in for good measure. Social media is exactly the same. You learn far more in the doing. It’s great to hear the case studies but at the end of the day they’re just overviews. No matter how detailed they might be. If you’re looking to community manage, or get involved in, social platforms and talent communities, the only way is to get your hands dirty. You’ll soon see that the ‘rules’ that float around aren’t always the good advice that they seem. You know the ones. About timings. Scheduling (or not). Tweet 100 characters or less. Where to position a link in your update. Not flooding your account with job posts. Who you should or shouldn’t follow. What gets Likes. Update an average 4 times a day. More than 2 #Hashtags affects engagement. Honestly, with all the accounts we’ve managed and been involved with over the years, every one of the ‘rules’ above (and more) have been blown away on different accounts and different audiences. That’s the key – the audience ‘tells’ you what they want. And as every business is unique, even in the same sector, what applies to one doesn’t mean it will work for another. One approach that’s successful for one facebook page, will fail on another. That’s what experience will tell you. That’s what your audiences will show you. You never hear failure admitted very often, if at all, in a conference case study. You wouldn’t expect to. (Although a #FAILconf, is an interesting idea…hmm.) It’s always success stories. That’s what everyone wants to hear. But the odd fail (or disappointment/surprise) is often much more enlightening. And the spur to keep looking at things differently.